My year is absolutely flying by. As I mentioned in my last newsletter, my father passed away on October 1. Now my brother and our respective spouses are deep in the process of cleaning out my parents home. My parents actually built their home before they were married. They had their wedding reception in their new home. Their wedding was in the United Brethren Church on November 9, 1941 in Webster City, Iowa.. My parents clothes were color-coordinated. Mother wore a rose colored dress and Dad's suit had a purplish cast to it. I have no idea how she pulled that off during the war years. Later Dad served in the Coast Guard but had a medical discharge after a short time. My parents celebrated their 71st wedding anniversary in this house. My Dad outlived my Mother by about 4 years, so my brother and I are cleaning out 75 years of accumulation. It seemed very intimidating at first but we keep plugging away. Just the office and 2 more bedrooms to go. Oh, and the basement needs to be finished. All those tools - what do we do with them? It has had it's delightful moments. For example, I just learned yesterday that my Mother's mother, Olive Stone, was the pianist at her church. I didn't even know Grandma played the piano. 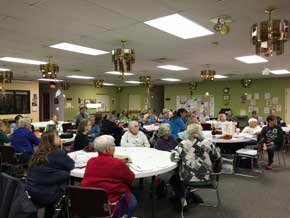 After Dad's funeral our first stop was at the Tall Pine Quilters Guild of White Cloud, MI. Daisy, our lab, was really tested that night. One of the quilters had a service dog. Daisy has been trained to stay on a blankie that our Granddaughter Livie, made for her. She really wanted to introduce herself to the other dog and to play. It was hard but she stayed on her blankie. For my parents 40th wedding anniversary I made them a pair of Rose of Sharon/Ohio Rose quilts. They were appliqued with Coats and Clark 30 wt. dressmaker's thread. Of course there is a story about the quilts. My husband and I had adopted 3 Korean girls. Along with our son, my business, my husband's work, boy scouts, 4-H, school activities, church activities, piano lessons and dance lessons, we found our lives very full. That didn't stop me from quilting. (Where there is a will, there is a way. - old cliche but true). 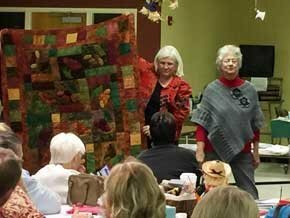 I got the first quilt done in time for their 40th celebration - a picnic with their church friends at Briggs Woods. Hand quilted, no less. It was almost a year later when I finished the second quilt. It was late but the folks used them for the last 35 years - on their beds - everyday. We all know the general rules for quilting such as "use 100% cotton fabric". And we all follow those rules. At least I do now. When I made my parents quilts there wasn't much 100% cotton fabric around so I bought and used what I could find. The background and solid pink and green are 100% polyester. The purple print is a mixture of polyester and cotton. It is much more difficult to applique polyester fabric than 100% cotton fabric. It requires more attention to detail and many, many more little tiny stitches. To get the smooth edges on these patches I came close to achieving the 16 stitches per inch that I aim for but rarely reach. These quilts have been used everyday on my parents beds for 35 years. They have been washed multiple times; the most recent last Friday. I washed them individually in cold water with Coldwater Tide. Ran them thru the 'High" spin cycle. After the washing I threw them in the dryer. I don't know how Mother washed them over the years but suspect she did the same method. 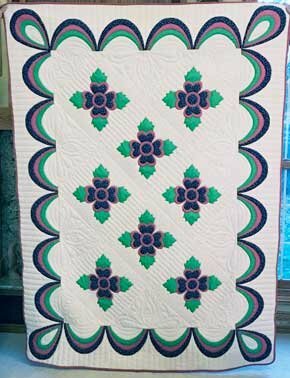 No "100% cotton" quilt would have survived this treatment as well as these quilts did. 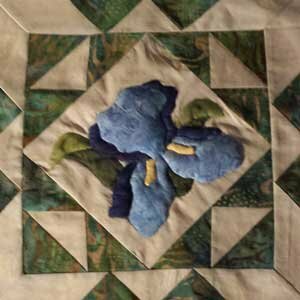 The applique stitching is holding the patches firmly in place. The edges are not fraying out. 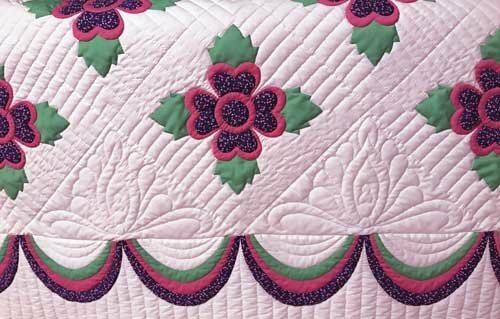 The quilt was hand-quilted with Coats and Clark quilting thread. There are no popped stitches. While I will still stick to 100% cotton (most of the time), I have to acknowledge that these polyester quilts will outlive any of my other quilts. 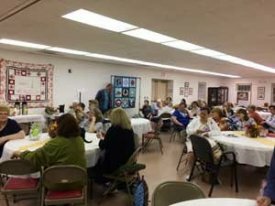 Our last stop on our fall trip was with the Town Hall Quilt Guild in Clarkston, MI. 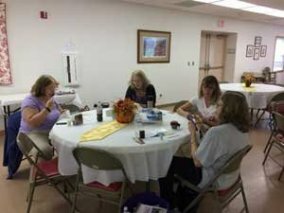 They were the smallest group we visited, but let me assure you, these gals love their applique. It is my hope that they all make the patterns they purchased and then send me photos of the finished projects. They could supply photos for my newsletter for a year. It was a great way to end our travels for the year. 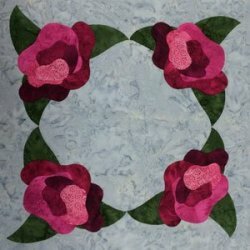 I'm delighted to announce that my block "Squared Roses" was selected for Quiltmaker's 100 Blocks, Vol. 14. This is the second time I've had a block in this great magazine. The first was in Vol. 5. 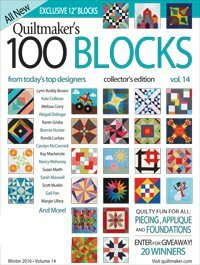 This time I'm participatig in Quiltmaker's 100 Blocks Blog Tour. It begins today, November 14. Just click on the magazine photo to the left. You will be taken to the Blog. This is a multi-day blog tour. My website will be featured on Thursday, November 17th. 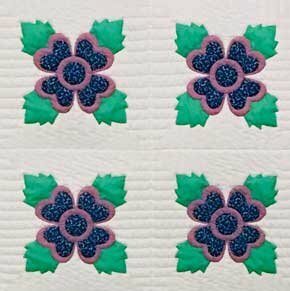 See a table runner and a bed size quilt using the "Squared Roses" block. 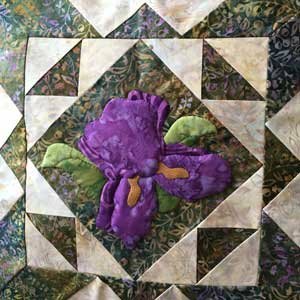 I've also included tips for working with batiks. Later on my page, you can click on a link to learn the secret of beautiful applique. 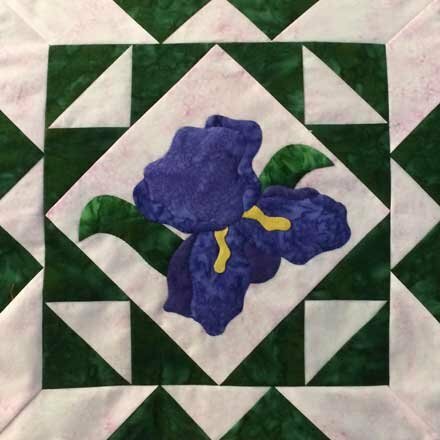 This month's free BOM is an Iris block. Use ultra suede for the iris beards. Download November Block - "Iris". Download October Block - "Tulips". Download September Block - "Dogwood"